Cutaway view of Spektr module of Mir. Russian manned space station module. Spektr was a module of the Mir space station. It began life as a dedicated military research unit. Built by Khrunichev for MOM > RKA, Russia. Launched 1995. AKA: 11F77O;Oleg;TKM-O. Status: Operational 1995. First Launch: 1995-05-20. Last Launch: 1995-05-20. Number: 1 . Gross mass: 19,640 kg (43,290 lb). After the collapse of the Soviet Union, all such work was stopped, and the spacecraft never left the shop. In NASA agreed to provide funds to complete the Spektr and Priroda modules for Mir using US funds, with 600 to 700 kg of US experiments installed in place of the military experiments. Originally the modules attached to the Mir base block were to be of the NPO Energia 37KS design. Design and fabrication reached an advanced phase when it was decided that the separate tug concept resulted in too low a net scientific payload (3 metric tons). Integrating the tug with the module was expected to increase this to 5 metric tons and provide some reserve engine capability at Mir and additional pressurized volume. Accordingly the 37KS modules for Mir were cancelled in 1983. Competitive designs for integrated space station modules were submitted by KB Salyut and NPO Energia. The KB Salyut 77K modules were derived from the cancelled TKS manned ferry. The competing proposal from NPO Energia combined the 37KS module with the engine unit of Mir. In June 1984 the KB Salyut design was selected. The revised Mir program plan was to assemble the station over a three year period, and operate it for ten years (versus the original one year/five years). Spektr was to have been a dedicated military research unit, to test sensors and systems for the Soviet Fon counterpart to the American Star Wars program. KB Salyut had designed a spacecraft bus for space based weapons based on the TKS space tug. This was an alternate / competitive design to the NPO Energia USB. By September 1991 it was planned to launch the spacecraft one year later, conduct one month of autonomous tests, and then dock with Mir. But after the collapse of the Soviet Union, all Fon 'Star Wars' work was stopped, and the spacecraft never left the shop. In July 1993, as part of joint US-Russian activities leading up to the International Space Station, NASA agreed to provide funds to complete the Spektr and Priroda modules for Mir using US funds, providing 600 to 700 kg of US experiments would be installed. In place of the Oktava complex an unpressurised cylinder with mounting area for two additional solar panels was installed. The airlock that would have been used for the Oktava targets instead would be used to expose scientific experiments to the vacuum of space using a small manipulator arm. The configuration was approved in November 19983 with launch planned for one year later. Delays were encountered in getting NASA's equipment through Russian customs, and the launch did not finally take place until 20 May 1995. Lira - optical sensor to identify ballistic missile warheads as well as satellites. After identification of a target the system handed off to the Buton tracking system. Buton - radar system designed to track ballistic missile re-entry vehicles and satellites. The tracking data would be used by the Oktava interceptor rockets to destroy the target. Oktava target dispensing system - small targets for test of the sensors would be ejected from three containers on the bottom of the Oktava complex. Larger targets would be ejected through an airlock at the top of the pressurized compartment. PIM-K - this was a modified version of the multispectral instrument first tested on Cosmos 1686 aboard the Salyut-7 space station. Its purpose was to discriminate between re-entry vehicles and decoys. Elas - military system of unknown purpose; possibly involving directed microwave energy. Scientific instruments Balkan-1, Faza, Fenix, Astra-Z, Grif-1, and Taurus for spectral analysis of the earth's surface, upper atmosphere, and orbital charged particle environment. The revised Spektr module, the fifth Mir component to attain orbit, was primarily designed for Earth observation (specifically natural resources and atmospheric studies). The module also carried US/Russian equipment for material science, biotechnology, life sciences, and space technology studies. A small airlock and manipulator arm were available to attach small external experiments and deploy small satellites. The module's total pressurized volume was 62 cubic meters. 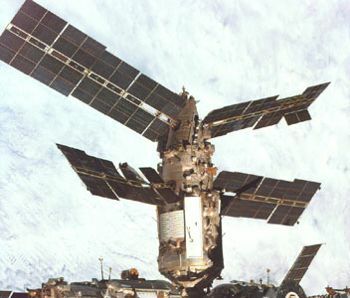 The module originally docked with the station on June 1, 1995, and was moved to its permanent location at a Mir transfer compartment radial port on June 2, 1995. Two 3.9 kN main engines and 400N attitude control thrusters (N2O4/UDMH) were used for initial approach and docking. Two 27 sq. meter solar arrays (6.9 kW), and two 38 sq. meter solar arrays (9.3 kW) were attached to the module. Energy storage was available via a 360 A-hr NiCd battery system. Balkan 1 lidar - measures upper cloud altitude. Used a 5320 angstrom laser source, provided 4.5 m resolution. Phaza spectrometer - surface studies. Examined wavelengths between 0.340-285 micrometer, and provides 200 km resolution. Astra 2 - monitored atmospheric trace constituents, Mir environment. Taurus/Grif - monitored Mir's induced X/gamma ray background. KOMZA - interstellar gas detector. Family: Soviet Space Stations, Space station, Space station orbit. Country: Russia. Engines: KRD-442. Spacecraft: Mir, Mir complex. Launch Vehicles: Proton, Proton-K. Launch Sites: Baikonur, Baikonur LC81/23. Agency: Chelomei bureau, MOM. Bibliography: 182, 2, 20, 274, 453, 6, 67, 8, 6928, 13180. 37KS Modules for Mir cancelled, replaced by FGB modules. - . Nation: Russia. Spacecraft: 37KS, Kristall, Kvant, Kvant-2, Mir, Priroda, Spektr. Design and fabrication reached an advanced phase when it was decided that the separate tug concept resulted in too low a net scientific payload (3 tonnes). Integrating the tug with the module was expected to increase this to 5 tonnes and provide some reserve engine capability at Mir and additional pressurised volume. Accordingly the 37KS modules for Mir were cancelled. Work on the 37KE experimental module (Kvant) and the 37KB Buran modules continued. The function of the 37KS modules was taken up by modules by KB Salyut derived from the FGB. A competing proposal from NPO Energia for a unified spacecraft that combined the 37KS module with the engine unit of Mir was rejected. 1992 During the Year - . Work on military Spektr version cancelled - . Nation: Russia. Spacecraft: Mir, Spektr, Spektr - Original. The original Spektr design was to be armed with Oktava interceptor rockets and equipped with sensors to identify and track ballistic missile re-entry vehicles as well as discriminate decoys. In 1992, as directed by the Soviet Union's military and political leadership, all work on such projects was discontinued. The Spektr module was mothballed, then later converted into a civilian platform, partially funded by the United States. 1995 May 20 - . 03:33 GMT - . Launch Site: Baikonur. Launch Complex: Baikonur LC81/23. LV Family: Proton. Launch Vehicle: Proton-K.
Officially: Docked to Mir Jun 1 . 1995 July 17 - . Spektr module moved to final location on Mir - . Nation: Russia. Flight: STS-71 Mir EO-19. Spacecraft Bus: Mir. Spacecraft: Spektr. The module was transferred by the small manipulator arm on Mir to its final location at the Mir transfer compartment's starboard radial port..